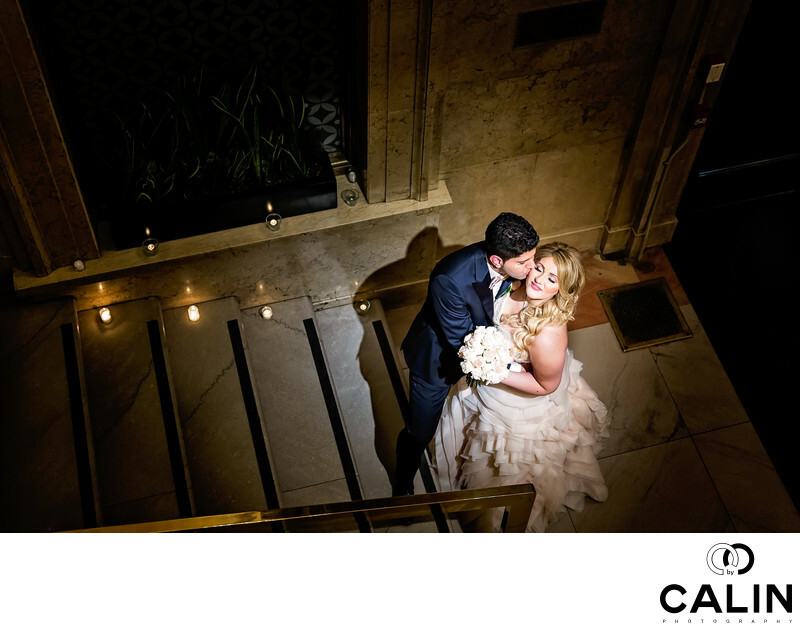 As a bride getting married at One King West, you definitely want the best photographer to capture the beauty of this popular wedding venue. When looking for THE best One King West photographer for you, it is important to make sure you like his work. Also, look at a few albums to make sure the quality is consistent. Finally meet him to see if his personality is something you can work with. The breathtaking image of the groom kissing the bride's cheek was captured during a blitz photo shoot in the lobby while the wedding guests were enjoying dinner. When I showed this bride and groom picture to a wedding planner, she told me I should double my rates to match the excellent photography quality I provide. As a bride I would stay away from "best photographers" lists compiled by publications such as Wedding Experts, Wedding Wire, Wedluxe. Very often the results depend more on the advertising dollars spent by the studio than on the excellence of photography. First the composition is outstanding. The bride and groom are placed at the impact point of the Golden Triangle. Also, I used a continuous light to increase the figure to ground relationship between the couple and the wall behind them. In other words the couple is the brightest part of this picture, which directs the viewer's eyes towards the newlyweds. A series of leading lines accentuate the importance of the couple as the undisputed subject in this image. Finally, the groom's navy blue suit complements the orange light cast by the massive chandeliers in the main lobby.